"What a club, what a rally! More than one person attending thought they had died and gone to heaven." Wagga was a spectacular success - I lost count of the number of times I heard people say "I think I've died and gone to heaven". 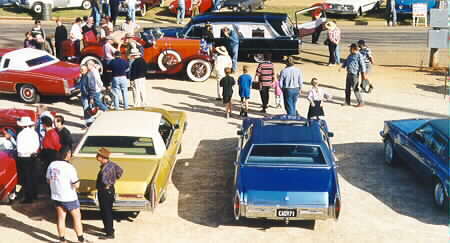 Cadillacs were everywhere, as were people enjoying themselves and mingling with other people. Graeme Hendy's original concept of a rally for pre-war Cadillacs and LaSalles grew and grew into the biggest and best-attended National Meet ever held. It became a fitting celebration of this fine Club's thirtieth anniversary, and a showcase of the thriving status of the Cadillac movement at the turn of the century. 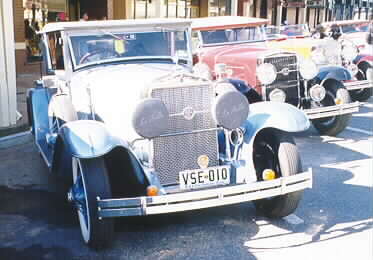 A few of those present remembered the Club's previous visit to Wagga in 1989 for its first National Meet, which was considered a great success with 26 Cadillacs and LaSalles attending. 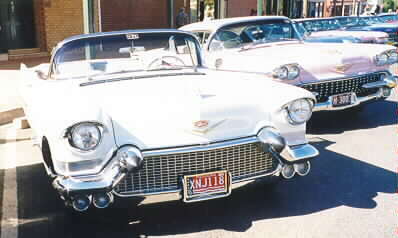 This time in April 2000, 56 Cadillacs and LaSalles arrived as official entries (several more cars were entered but did not make it due to various problems), and at least nine other Cadillacs visited during the Easter long weekend. 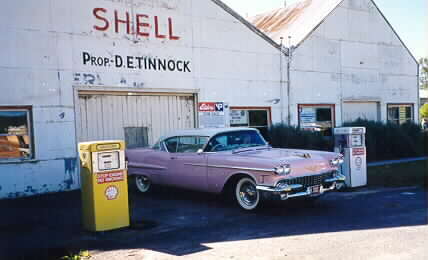 This was one of the largest gathering of Cadillacs ever held in Australia, and in terms of the distances travelled in Cadillacs to attend Wagga for four days, it was without doubt our most significant Cadillac outing to date. Eric Senior and his fiancee Angela accompanied me on the drive from Melbourne to Wagga on Thursday in my '39 La Salle convertible. 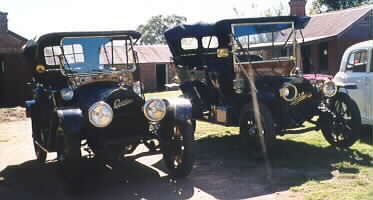 We drove up in full sunshine with the top down, waving to dozens of other collector cars on the highway Model A Fords, Monaros, lots of early English cars (on trailers), all heading south to attend their Easter national Club gatherings around Wangaratta. I won't dwell on the little wiring fire in the LaSalle upon arrival at Wagga, but I would like to thank Keith Kendrick for his assistance in repairing the loom in the motel carpark next morning. Lots of people were already there, and most other entrants arrived the next day which was Good Friday. The weather was perfect every day, and the Mayor of Wagga waved off the cars on their first morning of activities after claiming full credit for the good weather and for everything else good that ever came out of Wagga. Ralph Plarre acted as MC each morning, giving last-minute instructions with a loud-hailer to groups of about 150 members, friends and kids. All directions and maps were plainly displayed in the excellent rally booklet issued to each member, along with a list of entrants' names and their cars. This little booklet was set out by Craig and Scott Emmerson and designed and produced by Brendan Walsh from Shepparton, and it was a gem. On Saturday night, a special presentation was made by Craig Emmerson on behalf of Joan Moss, widow of the late Ken Moss, founder of our Club. Joan wanted to recognise with a one-off trophy some member whose contribution to the Club was having a major impact. The obvious recipients were Marilyn and Adam Laws, the supremely talented couple who lay out and produce each issue of our national magazine, and it is indeed among the best club publications in the country. The magazine is the lifeblood of the Club, the reason many members maintain their membership even if they do not attend Club activities. On Sunday after lunch at the most beautiful winery I have ever seen, we drove back to Wagga showgrounds for a display with the NSW Bush Council of car clubs, who had left an area for the Cadillacs among their own display of 260 of all kinds of vintage, veteran and classic vehicles. Well, the Caddies kept on arriving. 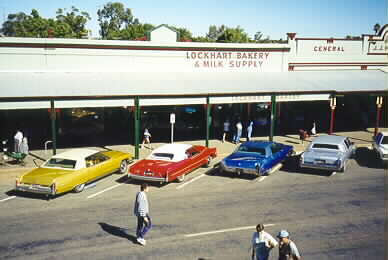 Almost seventy gleaming Cadillacs and LaSalles drove in and manoeuvred into our area, and the locals were simply stunned. We dominated their display and overwhelmed them, and I bet they are still talking about us and our cars. 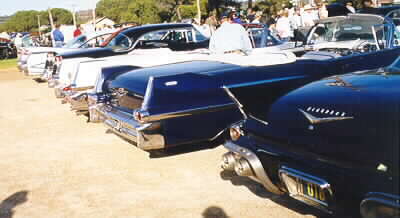 The crowd was huge, and Jan Hazeldene sold $2600 of Club caps, shirts, jackets, etc from the boot of their 58 Coupe deVille, much of it to non-Cadillac people. The Club made a small but worthwhile profit from these sales, and Jan thanked Joy Jenkins in particular for her assistance with the selling. On most of the outings over the four rally days, the earlier model Cadillacs were sent off ahead of the rest, and were gradually caught by the later-model, faster cars, so that all arrived at the destination roughly together. This was carefully planned by Graeme and the twins so that the old-model cars were not just left behind, as often happens on drives with cars from the 40 mph era mixing with cars from the 70 mph era. 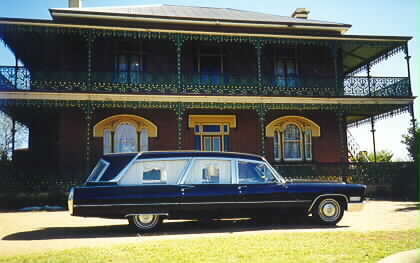 It was also no accident that people drove and/or travelled in other people's cars, giving many their first taste of travel in another period of Cadillac, or their first ride in a LaSalle. 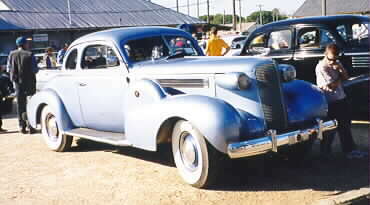 People were riding in rumble seats and convertibles all weekend, and the kids were having a ball swapping cars. Some owners had their first opportunity to drive another car of a similar model to their own, revealing differences or identifying faults that could be rectified. We believe that "Maybelline", the ex-Ken Moss 1912 four-cylinder Cadillac broke another valve spring while proving conclusively that it could outrun Bill Formby's similar 1912 model. Most attendees came from Melbourne or Sydney, plus three cars from Adelaide, two from Mildura, etc, and it was a real pleasure to have John and Gill Stringer from New Zealand with us. Arriving in Melbourne a few days before Easter, they rode to Wagga with the Sinclairs, and after it was all over, left for Sydney with Gordon and Lorna Smith. 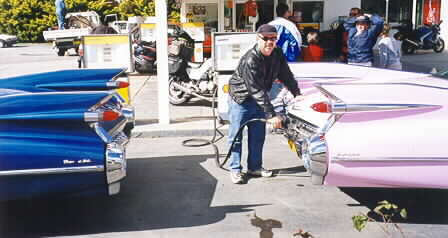 Some people were on their first ever Cadillac rally, and several were not Club members (but I believe most are now). On Monday evening, the rally was officially wound up, with presentations made and a dinner dance, again MC'd by Ralph Plarre. There was much discussion of the local WIN-TV news that screened at 6 o'clock that evening, which featured a couple of minutes of footage of the Cadillacs and owners at the motel that morning. The whole rally went so smoothly and was so well organised that an obviously large amount of planning had been done. And so it was. 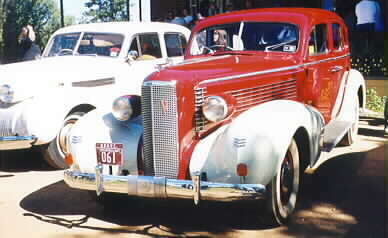 The magnificent rally resulted from the unseen work of Graeme and Margo Hendy, who originally decided to have a rally highlighting older cars, and who spent untold hours rounding up and notifying all known owners of early Cadillacs that they were invited to the rally, and of Craig and Scott Emmerson, whose preliminary contribution was simply monumental. In the previous six months or so, these energetic lads made no less than four trips from their Warragul home to Wagga, meeting local contacts, arranging venues, test-driving and selecting proposed roads, recording roadside features to note in the rally guide, checking prices and arranging payments at various venues, and a host of other invisible chores that ensured our four days in Wagga would pass trouble-free. 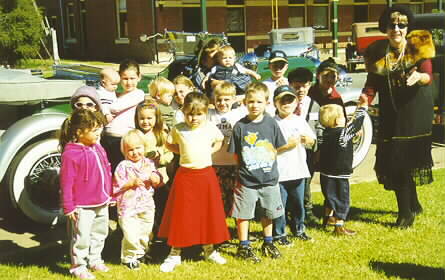 It is hard to believe that they had never organised a rally before, so perfect was their first effort. And the people attending - entrants and visitors, Club members or not - mingled and chatted as if they had known everyone for years. 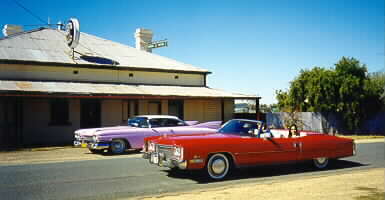 This was a vivid display of what Ralph calls "Cadillac fellowship", and it was rampant around Wagga for the whole time. Perhaps it was helped by the fact that no-one could find anything to complain about? Easter Tuesday was the day most had to travel long distances home. A very informal breakfast was staged by the motel pool, where people drifted in from 7am onwards, and many found it hard to leave, knowing that the experience would become just a collection of lovely memories any minute.